Friday, November 28th, was not like any other day. The day after Thanksgiving brought the first real look at Star Wars: The Force Awakens. The 88 second teaser of J.J. Abrams directorial debut in the galaxy far, far away premiered at 30 theaters across the United States and Canada and online. 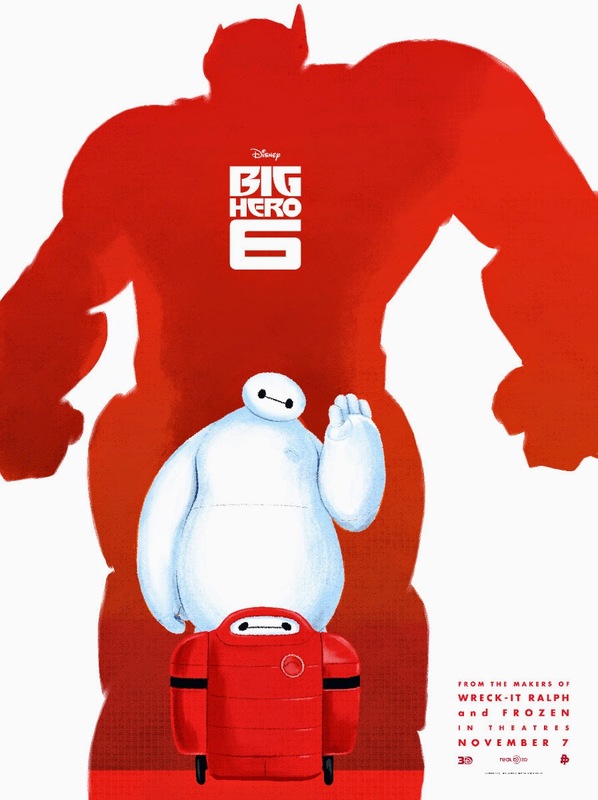 I got to the first possible movie with the teaser at 9:30am EST. I waited. My heart raced. My stomach turned in knots with anticipation. And finally... there it was. New Star Wars! There's no high quite like the one you get from seeing new scenes from the Star Wars universe. I left the theater after the trailer ended and went to Starbucks to write up a quick reaction for Nerdist just as the trailer was hitting the internet. I watched it twice more on my phone. 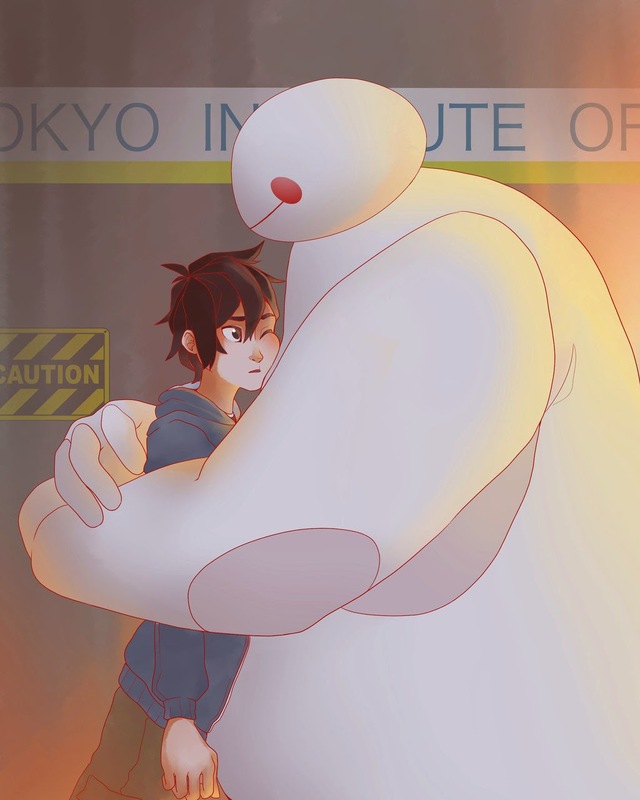 And once I returned home? Forget about it. I streamed it to my big screen and watched it repeatedly on my laptop. I was in an excited frenzy all afternoon and just about the time I started to calm down, I spoke with friends at The Star Wars Report and Full of Sith about the teaser. I slept soundly last night and woke up with Bill Murray's "Nothing but Star Wars..." on the brain. I have not been reading rumors about the plot or characters or looked at leaked concept art. All I know about the film is what has been revealed through official channels, and I'd like to keep it that way. I'm looking at the trailer without regard to any rumors and would appreciate if you didn't reference rumored plots in the comments. Which plots are rumors? All of them. We don't know anything for certain beyond what we see in this trailer. As as soon as I saw sand dunes on the movie theater screen, my mind screamed one word: Tatooine! I almost yelled it out loud and raised my hands. I restrained myself though since the theater was a subdued group and I don't think many of them were there explicitly to see The Force Awakens trailer. Anyway, desert automatically makes me think of Tatooine but that's because it's familiar territory. While it seems like a given we would go back to the home of the Skywalkers, maybe it's another similar planet. Maybe it could be Lothal, the planet that's the focus of Star Wars Rebels. While my heart was on cloud nine because seeing the dunes meant the Episode VII trailer was finally here (it was the last one before the film), a voice-over started. That voice-over caused quite the controversy on the ol' interwebs as many started insisting - sometimes vehemently - that it was Benedict Cumberbatch. Why they thought of Cumberbatch, I have no idea. He's not confirmed as a cast member and though I guess it sounds a bit like him, he was nowhere near my first guess. I thought it was someone in the movie, specifically Max von Sydow. It appears I was wrong though and it's actually Andy Serkis. Hitfix confirmed the identity of the narrator, and while I wouldn't have suspected Serkis, I'm not surprised since the man has continually proven himself to be a talented chameleon. John Boyega in stormtrooper armor appears from the bottom of the screen. My heart jumped. My first thought: new cast member! Second thought: the first footage from the new Star Wars movies kicks off with someone who is not a white male. I shouldn't have to call it out and compliment that but given that diversity in films and the Star Wars universe is a problem, props where props are due. Boyega's character is clearly under duress. He seems startled, confused, and really sweaty. That or maybe he crashed into an oasis in the middle of this desert. On the other hand, that armor looks awfully hot and confining. My guess? He's on the good side and was possibly undercover as a stormtrooper and made a not so smooth landing on the surface of the planet. Boyega's emotion in this quick clip set the tone for the trailer. It throws you into the story and makes you feel invested. What happened to this guy? Is he okay? Is he our hero? Is he Force sensitive? Can I give him a towel and a frosty beverage? And the quick part? Also a key part of the tease. The speedy pace is one factor that contributes to this first look feeling like Star Wars. Boyega's character seems to take in his surroundings in no time and turns. The move shows off a new style of stormtrooper armor, and it's sleek. Smoother and probably more efficient. I fully expect cosplayers to have full suits made by the time Celebration Anaheim rolls around. Also, wait a minute. The Force Awakens takes place about 30 years after Return of the Jedi. The Empire may have been taken down, but they're still kicking. Stormtroopers are still around. 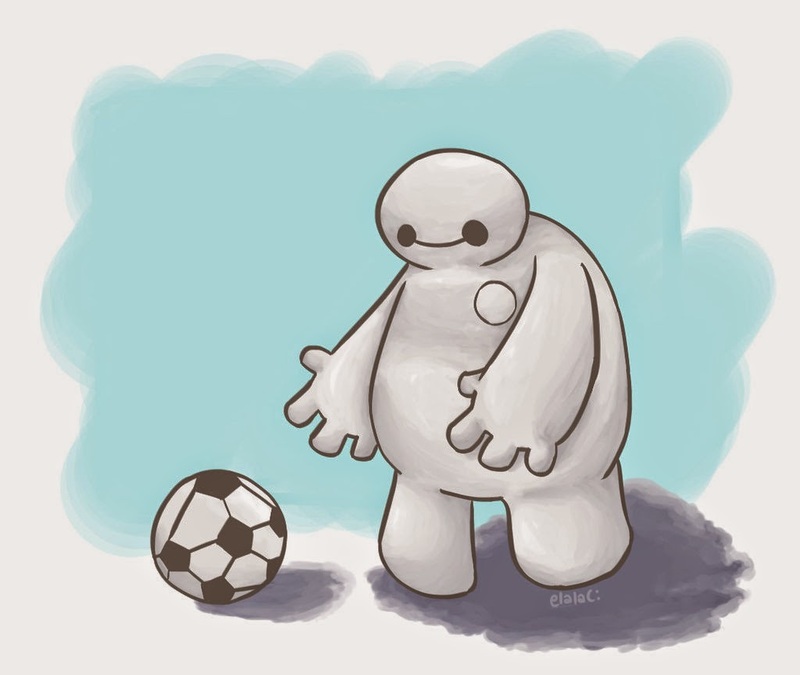 We leave Boyega behind and meet what has come to be known as soccer ball droid! 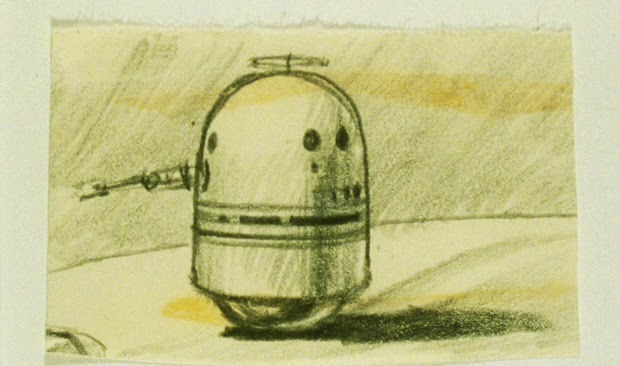 It's an astromech head on a rotating body, and he's adorable. 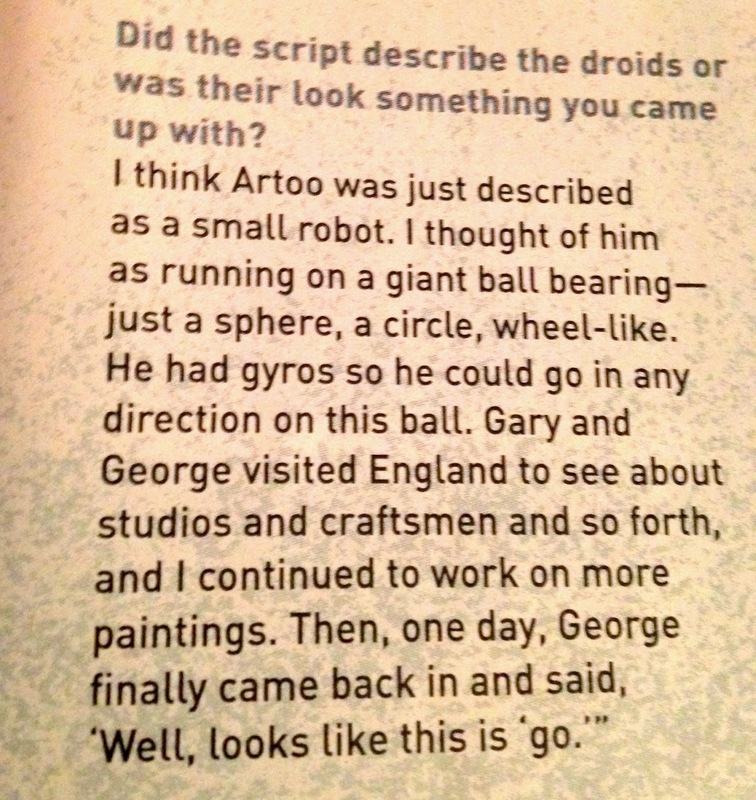 It's a different droid for a different time and trilogy and just another sign that time has passed. As the droid rolls along in the sand, you can see what looks like the hull of a podracer in the background. Now, the sport of podracing probably isn't exclusive to Tatooine, but we saw it happen there in The Phantom Menace. A clue that we've seen this planet before? Maybe. Interesting. You know, maybe he is legitimately a droid made from some kind of ball meant for recreation purposes. Maybe he was scavenged and repurposed. Stormtroopers in some kind of transport ship. Again, we see that their armor is improved. Their helmets have changed. Their weapons look upgraded. And notice how their heights vary? It could mean the guy who people are joking is "too short to be a stormtrooper" is a rebel spy tucked among the ranks (maybe it's Boyega's character), but I see it as a reminder that clones are no longer used. Stormtroopers aren't replicas of Jango Fett and haven't been since after Order 66. The Empire hasn't reverted back, and they're still powerful enough to have some legions of troopers and ships with which to move them. It sends a message that the fight is not over. Who or what are they assaulting? Next, we meet another member of the primary cast announced back in April: Daisy Ridley. 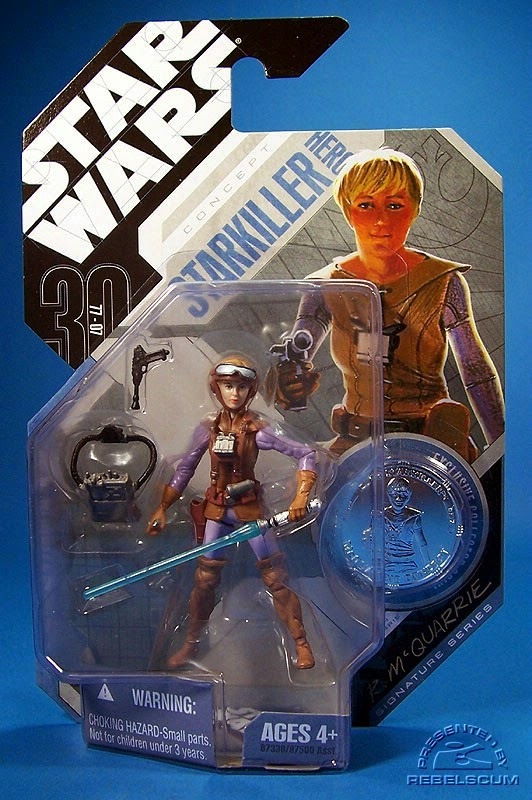 She's also on a desert planet and is piloting a vehicle unlike any other we've seen in the Star Wars universe. It looks like a fudgsicle, and I'm sure some on the desert planet would prefer that on a hot day. Also? The second face we see in the trailer is a woman. And now a third cast member, Oscar Isaac. He's in the helm of an X-wing, and he looks slightly worse for wear. His lip appears swollen, and he has a bruise on his cheek. He's wearing an inflatable vest (someone translated the Aurebesh and it says "Pull to Inflate" according to @Cevan77) and we'll see why in a moment. 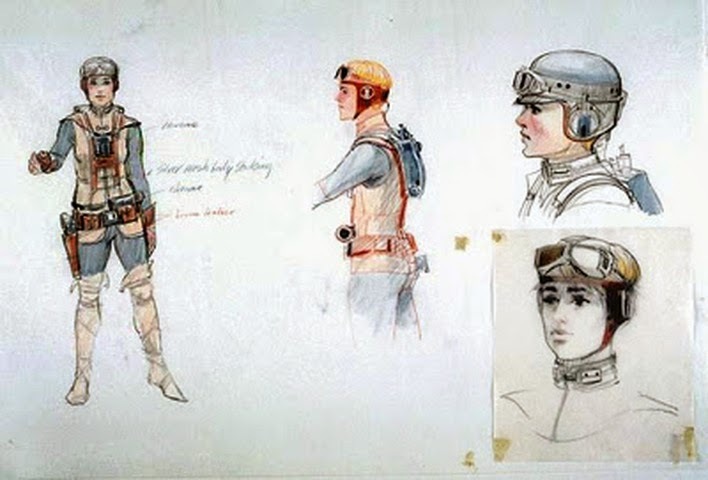 Note that the Rebel Alliance symbol, the Starbird, is prominently featured on his helmet and vest. That's interesting, isn't it? The symbol hasn't changed in 30 years. Just as there are still stormtroopers, there are still squadrons of X-wing pilots fighting back. My heart of hearts wants Isaac to be a member of the Antilles family because I have a soft spot for Wedge. Anyway, the fact that the teaser introduces Boyega, Ridley, and Isaac tells me they're the sequel trilogy's Leia, Luke, and Han (not necessarily in that order). These are our stars, the characters who will carry the Star Wars baton forward. Yeah, it's pretty awesome. PS: Since we're talking about diversity, the third face shown in The Force Awakens trailer? Also not a white dude. After cutting away from Isaac, we get a second or two of X-wing sexiness. A squadron of updated X-wings with s-foils open fly across a body of water surrounded by hills, and it is just so damn pretty. I won't pretend that I know the ins and outs of X-wing construction, but it's obvious the design has evolved in the last 30 years - as it should - but also goes back in time as these ships echo McQuarrie's concept art. And then an ominous figure ambles into view - a figure in dark robes who moves in a predatory fashion. The character seems to have a slight limp but strides with purpose. The voice-over comes back in, "The dark side..."
The Sith lunges and ignites a red lightsaber. The blade doesn't look as smooth or sound the same as lightsabers we've seen before. It vibrates differently. Plus? The handles frakking ignite. The lightsaber has CROSS-GUARDS. Holy Ewoks. The cross-guards look more like fire, but it's hard to tell. The plasma blade very much has the look of being homemade. I'm guessing the Sith made it on his or her own without the guidance of a master. The snowy forest feeds my shot-in-the-dark theory that the Sith is a recluse living in a cave in the middle of nowhere. Isn't speculation fun? The lankiness of the figure makes it seem like the person under the robes Adam Driver, but it could be Gwendoline Christie (I'm surprised no one's done a side-by-side with Brienne of Tarth yet) or someone else entirely. Whoever it is, this shot is chilling and creates a striking and memorable image - just like so many other striking and memorable images in this trailer. It tells us not only is the Empire still a threat but so are the Sith. They are not eradicated, and where there's one Sith, there's usually another. Unless they've seen that maybe the whole "rule of two" thing has historically not worked out well for them. After a pause, the voice-over continues, "... and the light." The new theme music by John Williams swells and the glorious Millennium Falcon swoops into view. This is when I cried. Han Solo's ship is as stunning as ever (look at that rectangular radar dish!) and whoever is piloting isn't just showing off over the dunes (Tatooine again?! ), he or she is evading TIE fighters. The Empire is everywhere, and the Rebel Alliance is still fighting. As the trailer closes, the sound of a lightsaber powering down plays. Why is December 18, 2015 so far away? Overall, the tease left me feeling excited. And it was just that - a tease! The mystery of The Force Awakens teaser stood in stark contrast to the Cinderella trailer that aired just before it in the theater I was at. The Cinderella trailer told the entire story of the movie. I'm not exaggerating. With The Force Awakens, we saw a brief taste of what's ahead and focused on the new cast. It could have easily been a long shot of Luke, Leia, and Han in the cockpit of the Millennium Falcon and most of us would have been happy. Instead, Abrams went in a bolder direction. He showed us new faces, didn't reveal too much of his hand, and gave us some familiar and exciting sights and sounds (new John Williams music!) with all the ships - the X-wings, the TIE fighters, the beautiful Falcon... And that mysterious voice-over! On top of all that, we didn't go into space. Very interesting. What a time to be a Star Wars fan. Did you like the teaser? Bucky Barnes caused a lot of trouble for Steve Rogers in Captain America: The Winter Soldier. It was hard to see Cap's friend turned into a weapon, but on the plus side, at least Bucky didn't die? It's kind of a positive. He's been through hell, but there's still hope for him and I don't think we've seen the last of Sebastian Stan in the role in the Marvel Cinematic Universe. 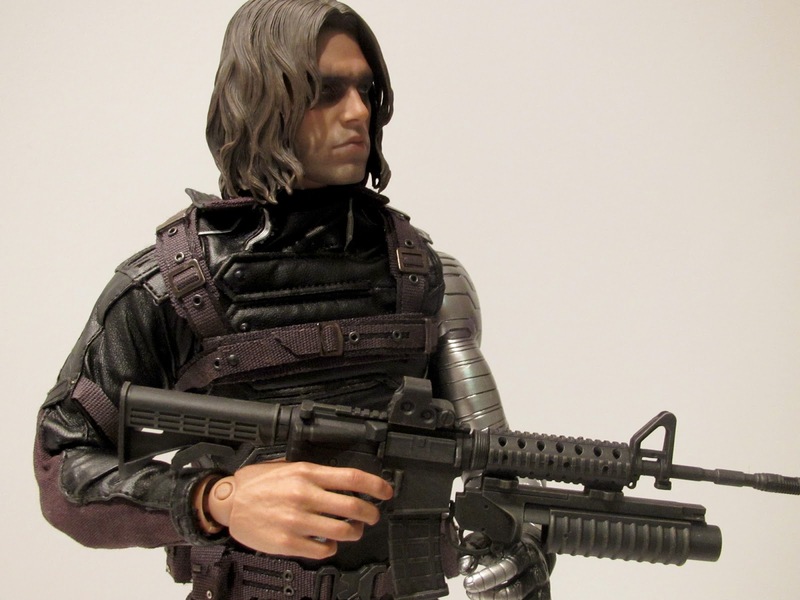 Until he's back on the big screen, you can bring a much less deadly version of the Winter Soldier home thanks to Hot Toys and Sideshow Collectibles. 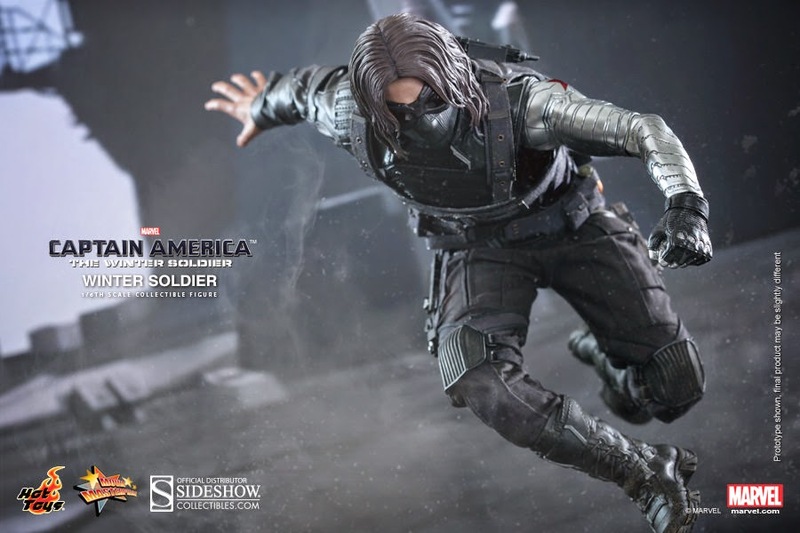 Hot Toys has made a remarkably detailed sixth scale figure of the Winter Soldier, and Sideshow Collectibles has it available to order now. 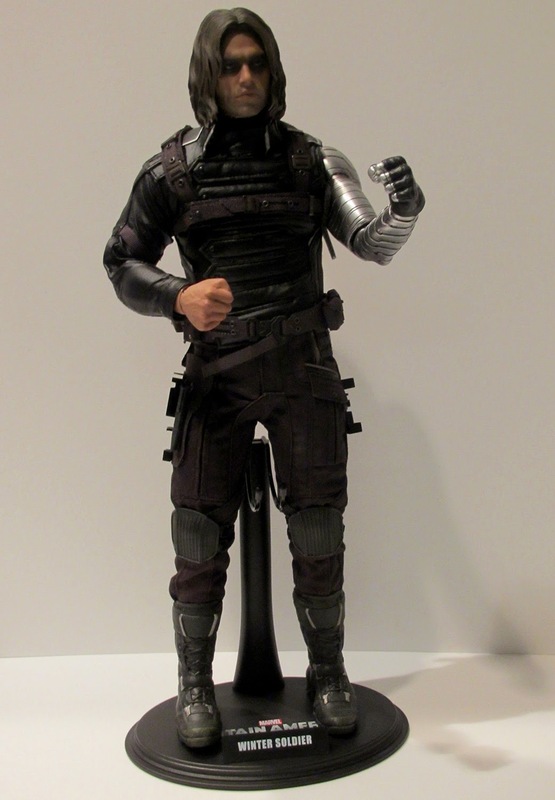 They sent a figure for me to review, and as usual, I'm impressed by the quality Hot Toys puts into their collectibles. 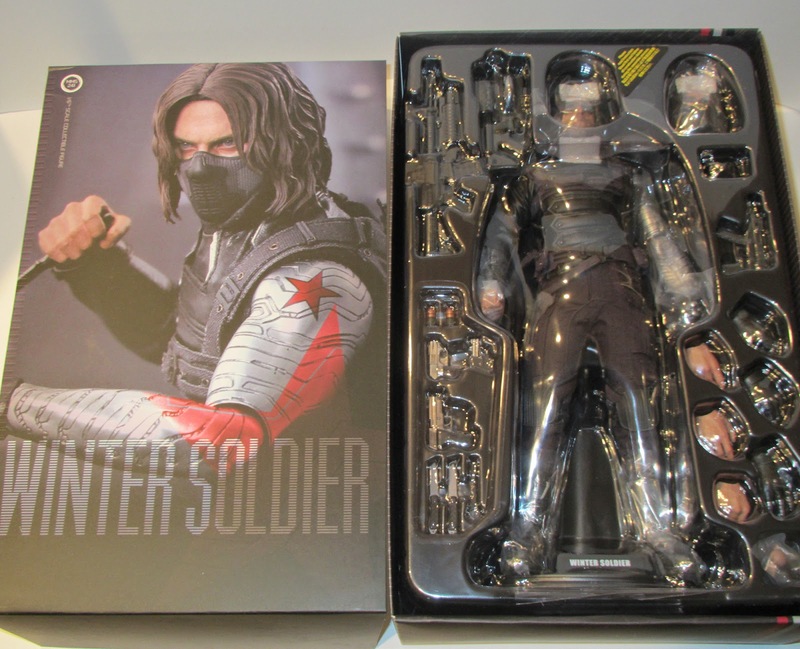 Packaging: The Winter Soldier arrived in perfect condition. The statue even has an attractive outer box. 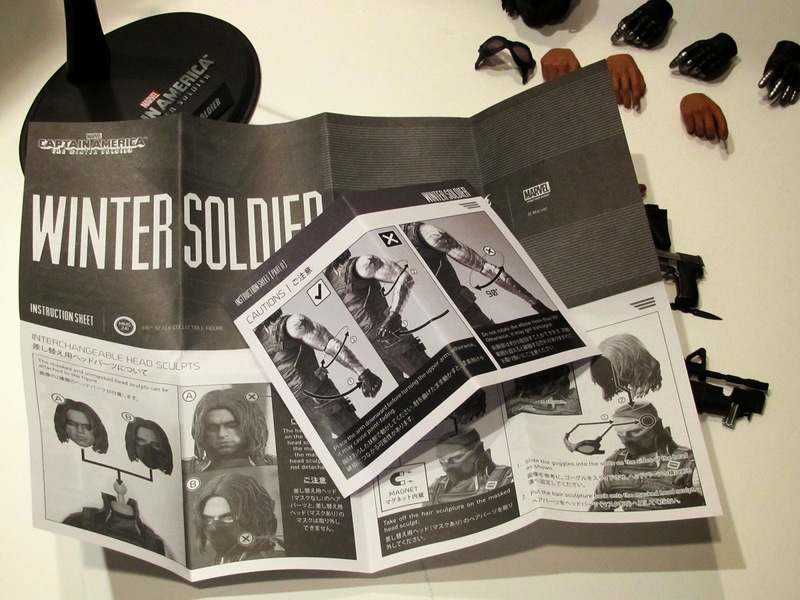 Hot Toys ensures there's a place for every last accessory in the plastic, and each little pocket in the packaging is made to fit a particular item. Because of that, I always take a photo before I start removing accessories (even when I'm not reviewing an item). Otherwise, it's like trying to refold a map. 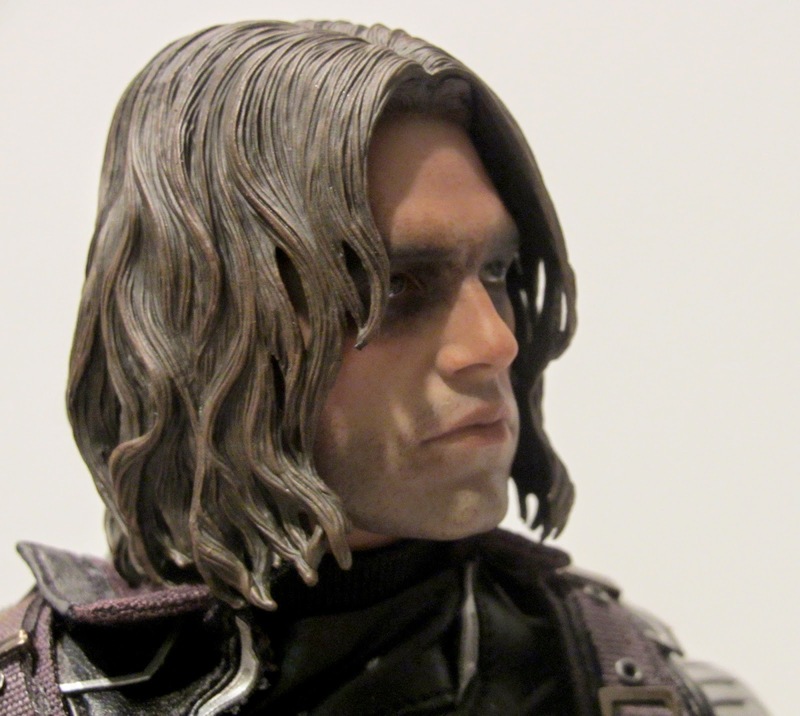 Sculpt/likeness/paint: Don't worry, the Winter Soldier figure does indeed look like Sebastian Stan. One head features his face unmasked, and the other has a mask and has removable hair so you can slide on snazzy goggles. The paint on the face is especially well done. 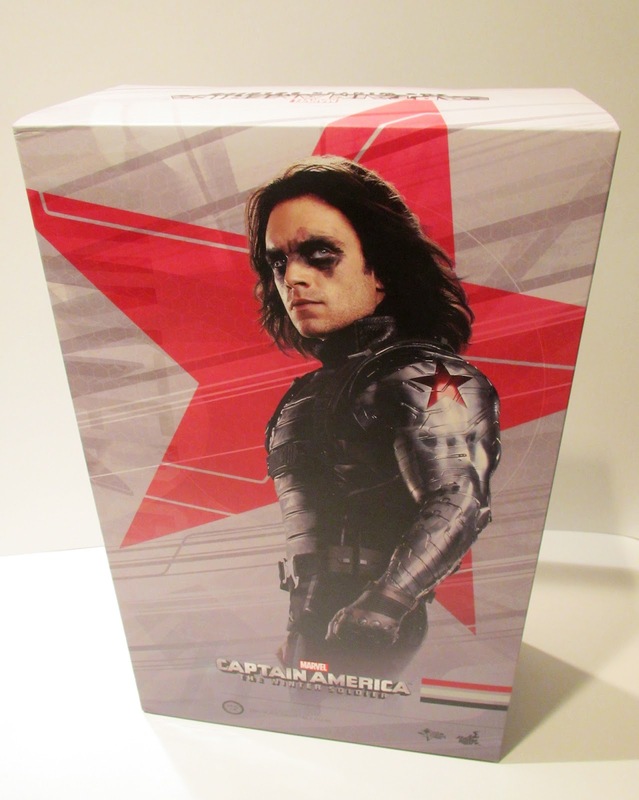 It looks like Winter Soldier legitimately has facial hair stubble, and the black paint around his eyes is spot on and gives that effectively creepy vibe. 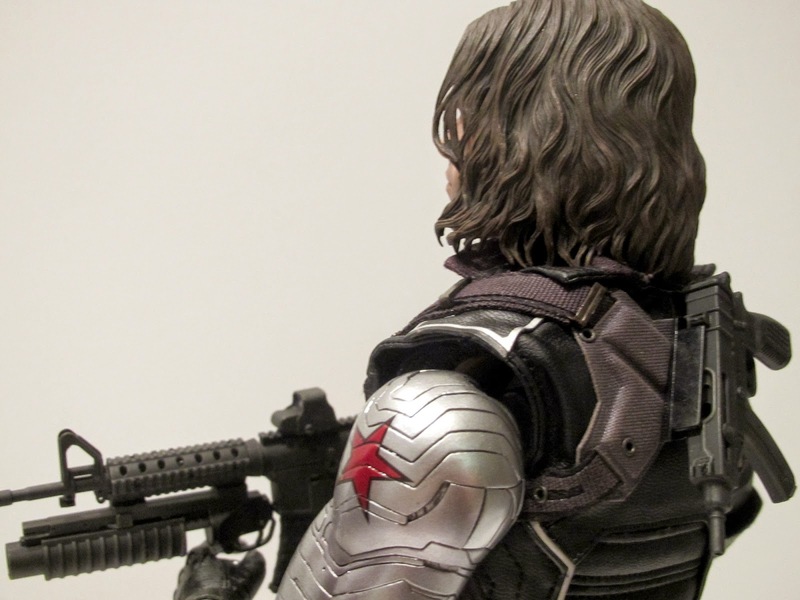 I'm not a fan of the sculpted hair but a couple of things about that: Winter Soldier had some pretty lackluster and tangled hair in the movie and I can't imagine a more realistic approach to the hair that would also look good. The plastic hair looks fine from a distance. The facial sculpt successfully captures Stan's intense visage from the movie. He's an intimidating character and that comes across here. 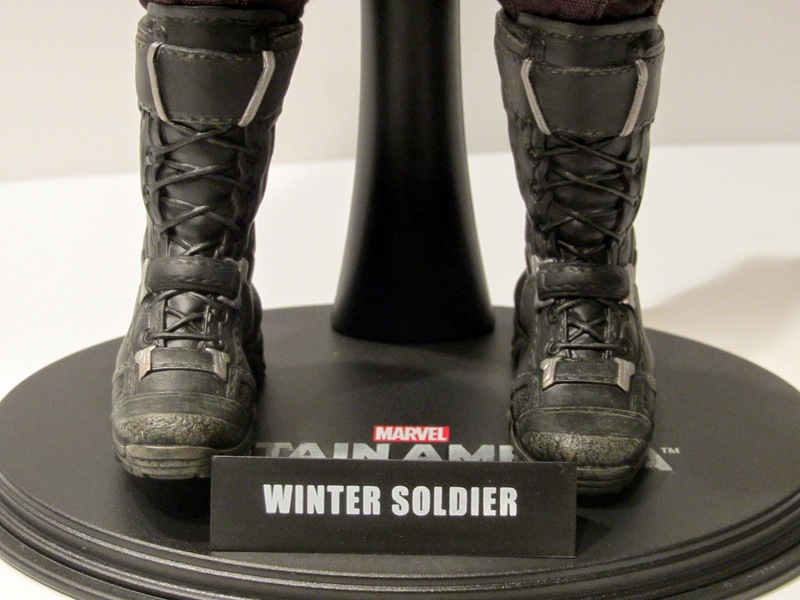 Clothes: The Winter Soldier's outfit is all about being practical. He's got buckles and straps and holsters freaking everywhere. 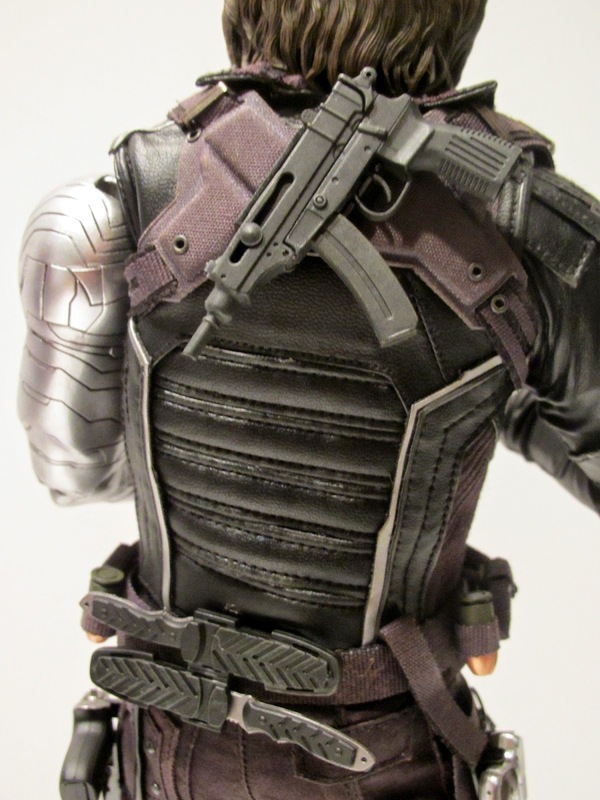 Hot Toys did a tremendous job considering just how small those buckles and straps are. They blended textures and fabrics so the figure is a realistic representation of what you saw in Captain America: The Winter Soldier. The jacket is a leather-like material while the rest of the ensemble is canvas. It doesn't look too beat up, but you can tell this isn't a straight off the rack costume. It's lived in. And how about that cyber arm? It's made to look like metal (real metal would do weird things to the figure's balance) and painted to match the one in the movie. Every line is there. He also looks good in a simple standing pose, too. 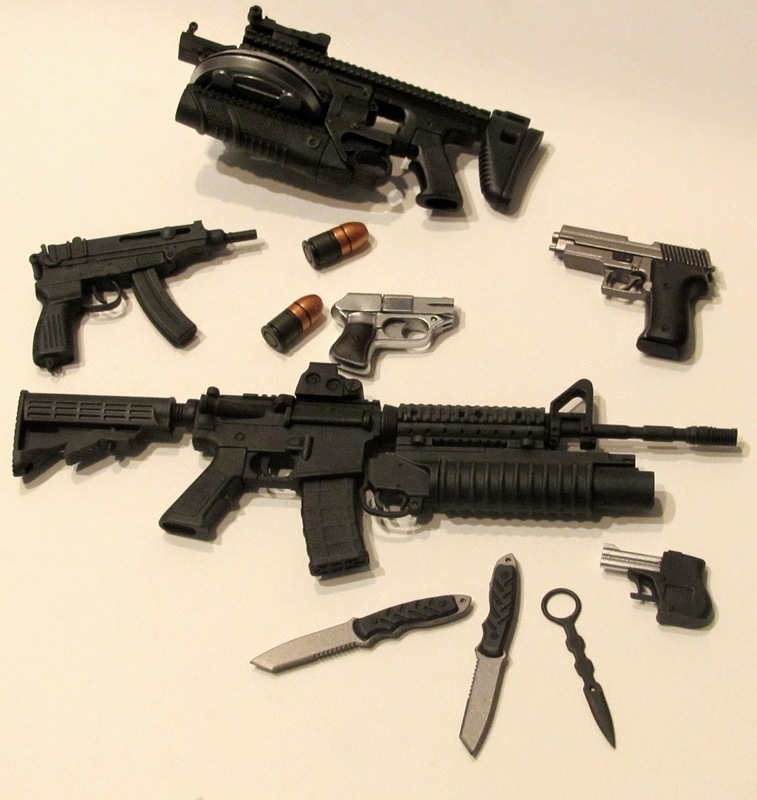 One machine gun, one remote bomb launcher, one submachine gun, one spike with sheath, two daggers, two grenades, and three pistols. 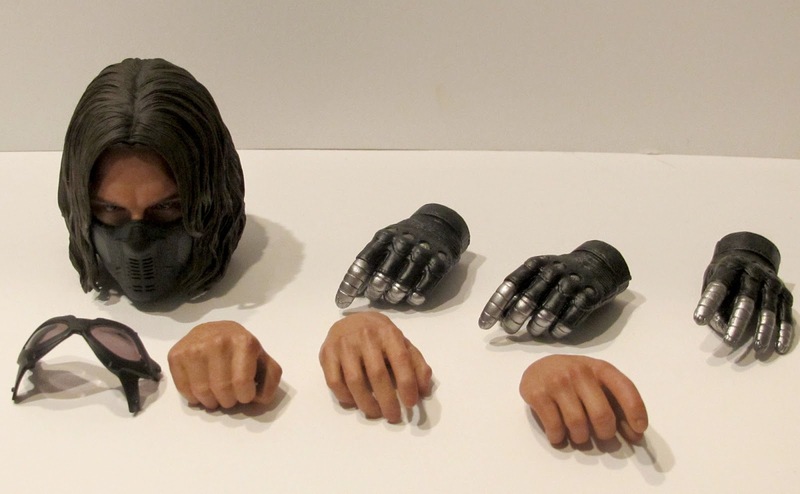 The following artists worked on the figure: Kojun (Head Sculpt), JC. Hong (Head Paint and Head Art Direction), and Seung Min and Kang (Accessories Sculpt). 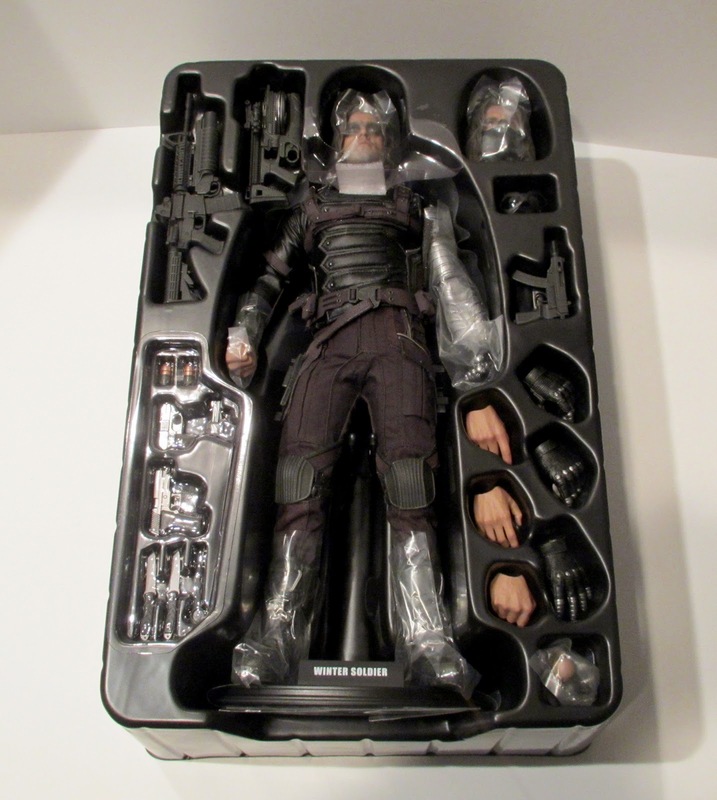 Full disclosure: Winter Soldier was provided by Sideshow Collectibles for review purposes. This did not affect my review of the product. LEGO had it right in the 1970s. They supported gender equality and made a clear statement about it. They still do encourage both boys and girls to play with LEGO sets but some of that message is undermined by the fact that they have released the LEGO Friends line and marketed the overly pink collection as LEGO for girls. But, that's a rant for another day. Take a minute to read this note posted by Henry Warren on Twitter. A lot of boys like dolls houses. They’re more human than spaceships. A lot of girls prefer spaceships. They’re more exciting than dolls houses. The most important thing is to put the right material in their hands and let them create whatever appeals to them." Preach. Kids and parents need to hear more of that sentiment. "Yes, the text is from 1974 and was a part of a pamphlet showing a variety of LEGO doll house products targeted girls aged 4 and up from the 1970’s The catalogue was included with select sets in the doll house series in 1974. The text remains relevant to this day – our focus has always been, and remains to bring creative play experiences to all children in the world, based on the LEGO brick and the LEGO system – ultimately enabling children to build and create whatever they can imagine. This is visible today across the entire product range from the LEGO Group – every LEGO product is based on the LEGO system and this creative building experience." 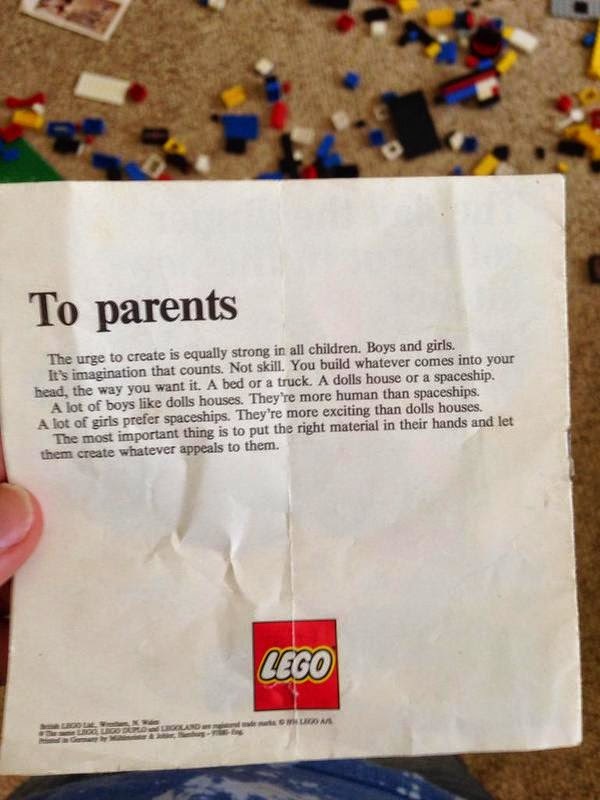 I wish LEGO would go back to their egalitarian approach to marketing. The wreath on the left is inspired by a design in Star Wars Galaxies, and the one on the right features red ribbons for the red Life Day robes and a blue Life Day orb. I'm sort of in love with them. Read the instructions at the official StarWars.com blog and get crafting! 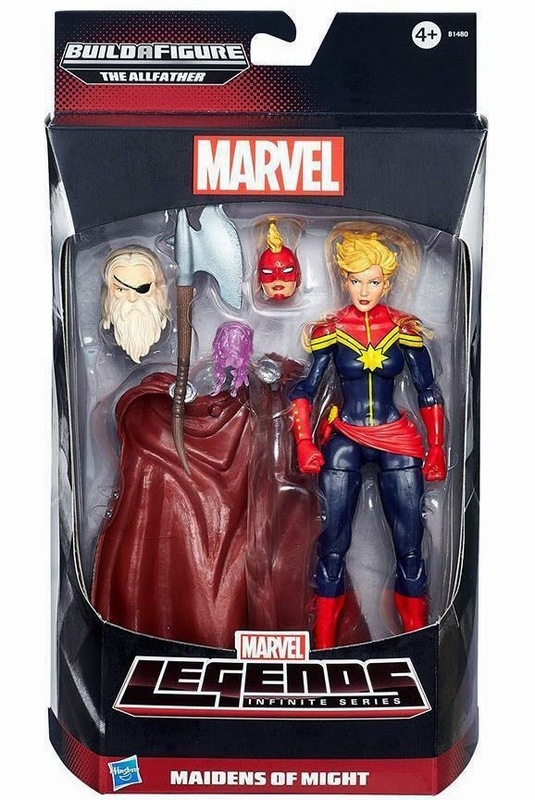 The Carol Danvers Captain Marvel figure is part of the Marvel Legends line and will be out in 2015. 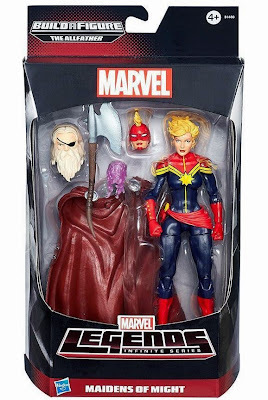 She's sharing a box with Odin's head because every figure in the line has bits of Odin that can be assembled into the All-Father. Of course. You can check out the rest of the figures in the line at Marvel Toy News. 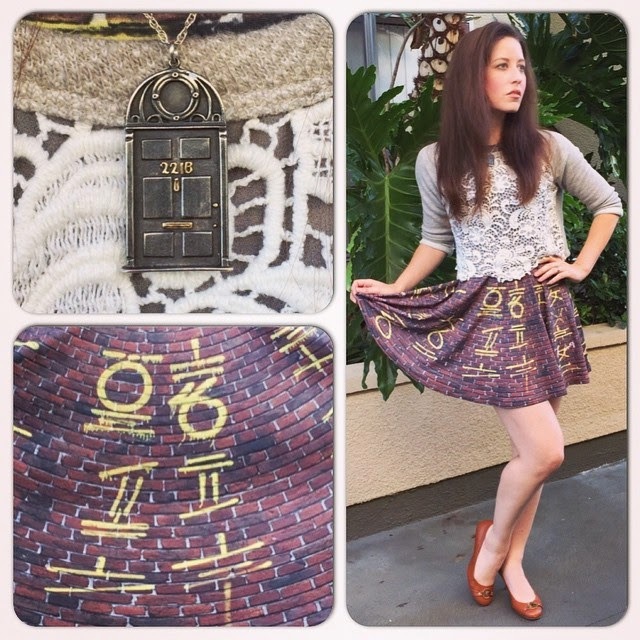 The creative folks over at Set to Stunning have made November a month of celebrating geek fashion with #Nerdvember. The hashtag is tied to a month-long contest that Set to Stunning runs on Instagram. Here are the basics: participants wear a geeky outfit and take a picture, slap the #Nerdvember hashtag onto the picture, and get entered into a contest to win prizes. Neat, huh? The prizes are available in different tiers in order to encourage participants to put together some geek-inspired outfits all month long. For example, if you participate for 1-10 days, you're entered to win in the Prize Tier 1 group. If you participate all 30 days of November, you're entered to win in the Prize Tier 4 group. The prizes get bigger the more days you participate, and Set to Stunning has gathered an impressive list of sponsors for #Nerdvember, including: Guild Jewellery, Black Milk Clothing, Espionage Cosmetics, We Love Fine, and Her Universe. Fancy, no? What counts as a geek-themed outfit? "Full geek ensembles are HIGHLY ENCOURAGED, but at a minimum you must be wearing at least one (1) piece of geek clothing/jewelry/accessory to qualify. If you’re wearing an “inspired by” look (i.e. Disney Bounding or Console to Closet type looks), please include a photo of the inspiration in your pic post or at least an explanation of how your outfit is geek themed." You can read all the rules at Set to Stunning. Even if you're not up for participating, you can search the #Nerdvember hashtag on Instagram for plenty of outfit inspiration. I lost it. This series genuinely makes me laugh out loud. 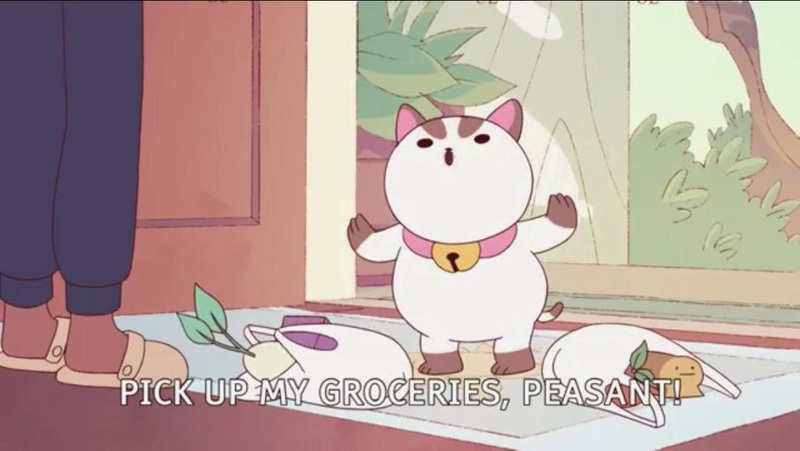 I only learned about the magic of Natasha Allegri's Bee and PuppyCat over the summer (if you have no idea what I'm talking about, take ten minutes and go watch the first episodes of Bee and PuppyCat now) so I haven't been waiting as long as the many fans who supported the Kickstarter project that allowed these new episodes to happen. I bow to their patience. 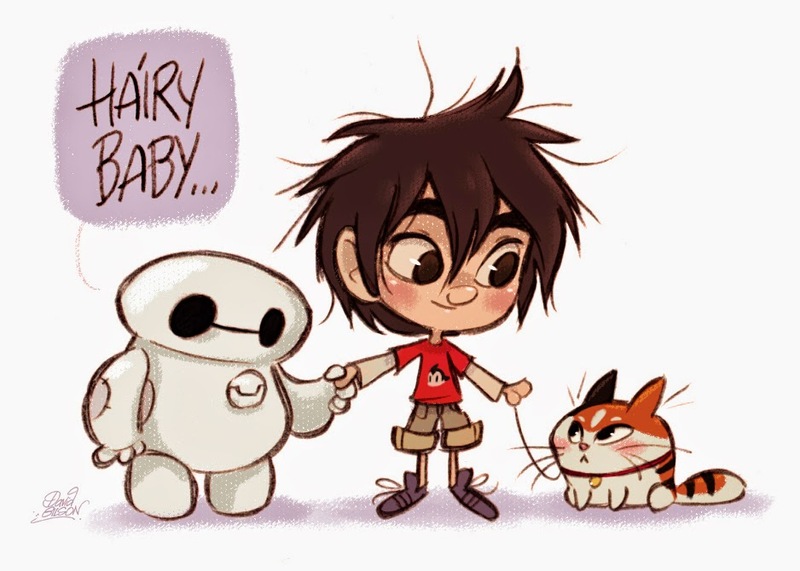 Why am I still writing when there's new Bee and PuppyCat to watch? Yeah, I don't know either. On with the video embeds! If you want to stay in the know about when more episodes of Bee and PuppyCat are released, sign up for the Temp Team newsletter. Who else likes mail? I rarely get mail that isn't a bill or a magazine or a check (not complaining about that last one). I have a couple of friends who I regularly exchange mail with and it's delightful to get a handwritten note or a thoughtfully sent box of Pocky. I don't have tons of Pocky that I'm willing to share because I really like Pocky, but I do have a pile of postcards. I've purchased postcards everywhere I've traveled over the last decade for the purpose of sending notes, but I haven't done enough of the sending part. My box of blank postcards is overflowing, and I'm not letting myself purchase more until I send most of the ones I have. Enter the Great Postcard Project. Even after sending postcards to everyone in my address book, I'll have dozens of them left. Dozens. From China, from Disney, from national parks, from museums - it's a mix. And I'd like to send them to you! Anyone who fills out this Google form with his or her address will get a randomly selected postcard with a brief note or quote or poorly drawn stick figure. Yay real mail! If you'd rather, you can email me your address too (my email address is right there on the sidebar). I promise I'll keep your address confidential and will not share it with marketing companies or use it for my personal newsletter that does not exist. Submit your address by November 21st to get on the list! Queen Gimmedala posted in an Episode VII title speculation thread and didn't list tons of guesses or possibilities - just one. The Force Awakens. And she nailed it. 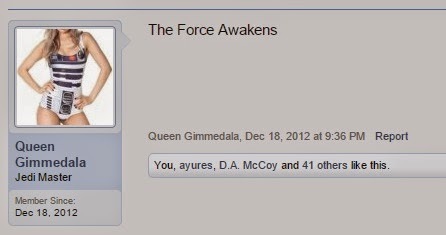 ScreenCrush dug up the post, and besides the fact that Queen Gimmedala got the name right, look at the date she joined the forums. December 18, 2012. 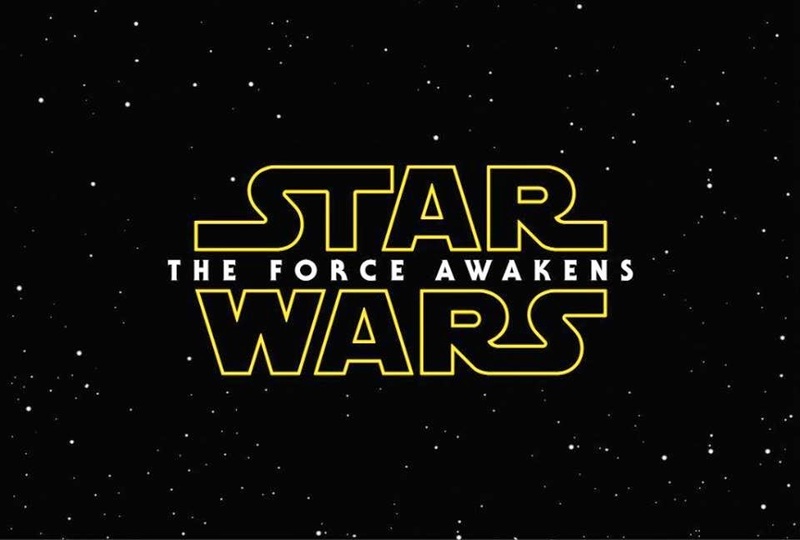 Exactly three years before the Episode VII release date of December 18, 2015. Weird, right? It's also interesting to note that until yesterday, she'd only posted to the forums twice as far as I can tell, and both posts were on the same date. I'm in love with Star Wars, PT and OT. I do not follow any of the EU. So my "knowledge" of the SW universe is really limited to the 6 movies and the recent tv shows. Huh. Her reasoning makes sense to me, and while this is probably all a huge coincidence, it's bringing up cries of a conspiracy. Is she an insider? Has the exact release date and title been planned since Disney bought Lucasfilm? Did Lucasfilm see this post and think the name was a brilliant idea? 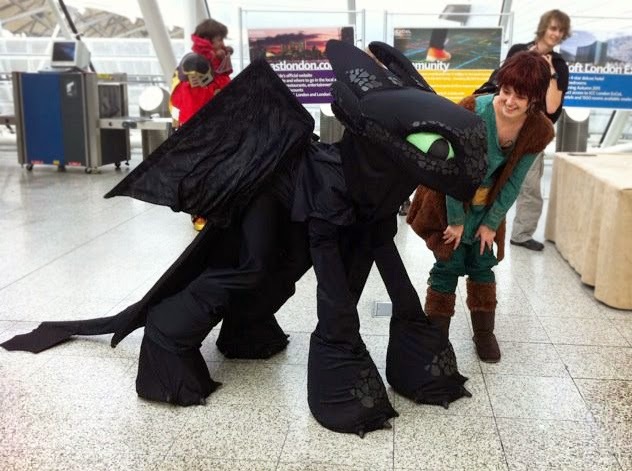 Full Toothless cosplayed by Jessica Angus, photo by Enko. I can't imagine how warm this costume must be, but the fabric used really sells the dragon skin look. 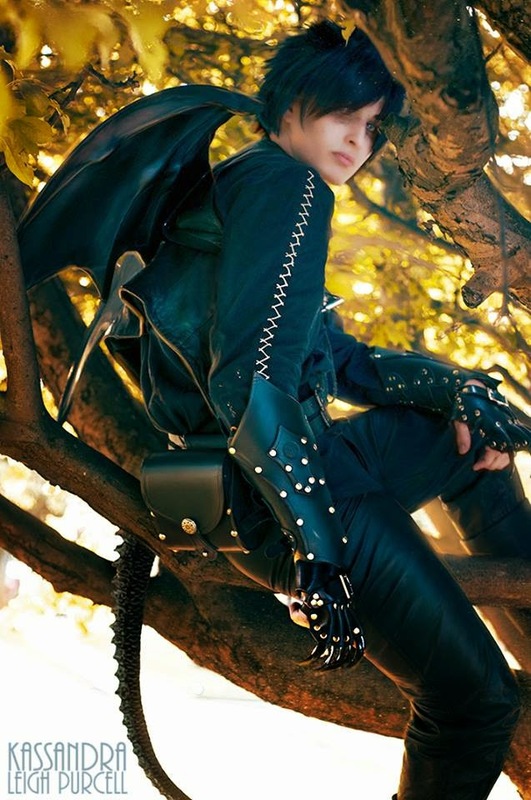 Humanized Toothless cosplayed by Professor Awesome, photo by Kassandra. 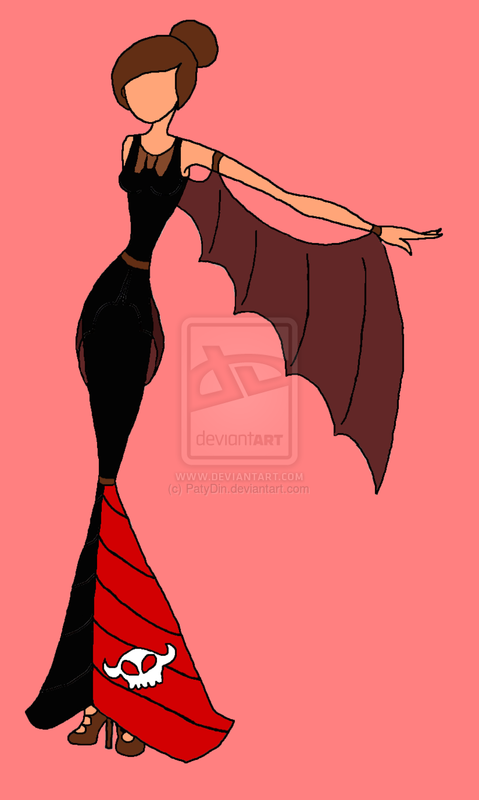 I like this human take on the character with black clothing, wings, leather and plastic claws, and a tail. It definitely seems like a more comfortable option than the full dragon suit. Classy Toothless dress design by PatyDin. As far as I can tell, no one has made this into a dress yet. It needs to happen. You could top it off with dragon necklace or maybe ears on a headband? Another complete Toothless suit cosplayed by NeverCryMoon, photo by Alexandra. This suit looks to be made of a velvety fabric, and it's wonderful - I love that this Toothless is paired with a Hiccup. 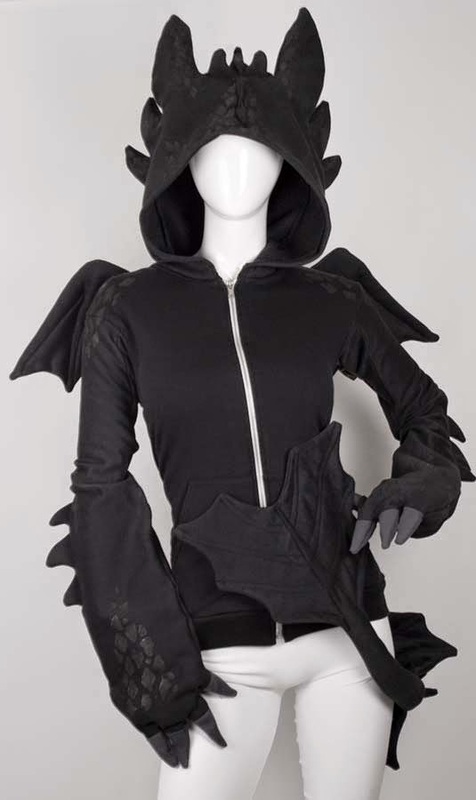 Go Toothless-casual with this dragon hoodie from Canada Cosplay. The fabric is textured in just the right places, and it has scales and a tail. You could pair it with some black pants for a simple and comfortable cosplay. Sweatsuit Toothless! 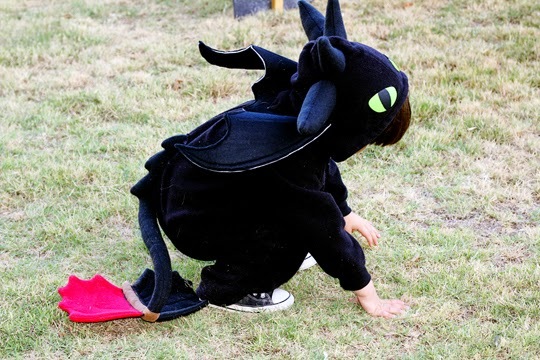 Vanessa Brady made her son a Toothless costume by converting a solid-colored sweatsuit. It's an affordable way to get the full dragon look, and she wrote a brief how-to. Want to see more awesome costumes? I've got a Pinterest board for that. Have any characters you'd like me to feature for "one character, different costumes?" Let me know in the comments!